"COLA", "Professional Left", "social security"
The "lefty" blogosphere and TV media is abuzz. Can you believe this? Barack Obama, a Democratic President, is talking about cutting (!) Social Security! Oh. My. Goodness. He endorsed the Gang of Six plan and the Fiscal Commission (oh, sorry, the catfood cumishun!!) as good bases in his press conferences. And those. Cut. Social. Security. Nooooo! We told you Obama suckzzzzz!!! Again, these "bend points" are adjusted by a formula that has been set in law since 1979, are based on wage-growth, and there is absolutely no changes to that formula in the gang of six plan, and the changes proposed to it in the Fiscal Commission plan actually increases the base benefits for the poorest workers who are also likely to have the least in savings or other retirement income. This should also clear up the facts for anyone who is pre-ordained to scream "means testing baaaaaad!!!" at any Social Security changes. Look again at the formula above. 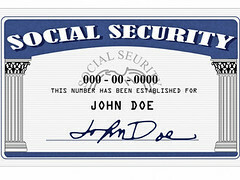 Social Security benefits are already means-tested. Now that we understand that, let's look at just what sorts of adjustments the President - and the gang of six - are talking about. It is changes to the formula which is used to calculate the Cost of Living Adjustment (or COLA) for social security. There is a bunch of factors that go into it, but it's safe to say that it's calculated to adjust for inflation. It is that formula that is being looked at for change. The idea is to go from the current method of calculation for price-inflation (i.e. CPI, or the Consumer Price Index) to what many economists believe to be a more accurate measure of price inflation, the chained-CPI. So what is Chained CPI and what is the difference between the current method of CPI calculation and Chained CPI? Let's have a look. The regular CPI measures the costs each month of a market basket of items that average Americans may purchase each month and so it tells us how much prices are rising, what the inflation rate is. The chained CPI is identical, really, to the regular CPI in all respects except one. It includes an adjustment so that if, for example, beef prices rise much faster than chicken prices, and consumers, as a result, buy less beef and more chicken, it picks up the switching from the beef to the chicken, which makes their total costs for the month rise a little less quickly than if you assumed they continued to buy the same amount of beef and the same amount of chicken as before. This makes the chained CPI a better measure of how much more spending rising prices are necessitating out of a consumer's pocket rather than simply assuming that consumers have no choice but to buy the same things regardless of price fluctuations. Actually, any high school economics student will be able to explain to you this phenomenon: it's called price elasticity of demand. The basic concept is that the more substitutes available for a good or service, the more the amount of such good or service demanded will fall with rising prices. One ought to also note that a measure of inflation is used in many areas of the government, not simply to calculate COLA on social security. Let's digest that. A minimum benefit of 125% of poverty level, which would be wage indexed after five years in the Fiscal Commission plan that the Gang of Six uses as a framework, would, by definition - and for the first time in the history of social security - ensure that no one eligible for full social security benefits gets a sub-poverty level benefit. It would also continue the current method of COLA for five years before switching to chained CPI afterwards. In fact, if the Fiscal Commission plan were adopted wholesale (which would raise the bottom threshold from replacing 90% of the first 9,000 of income to replacing 90% of the first $15,000 in income), the basic benefit for people with an average lifetime wage of $15,000 (in 2010 dollars) would increase by nearly $3,500. I suppose Nancy Altman of "Strengthen Social Security" is not too fond of ensuring that people who have worked a minimum wage job all their life be lifted out of poverty in their golden years. President Obama increased benefits for Medicare recipients. Health reform collapses and ultimately closes the prescription drug donut hole, saving money for seniors who have high drug expenses. Health reform provides for no-copay preventive care under Medicare (Part B), cutting out those expenses from seniors, encouraging more preventive care, and thus lowering the risk (and thus cost) of catastrophic care. In case there is catastrophic care, the Fiscal Commission has recommended putting a $7,500 cap on cost-sharing for Medicare recipients, which also gets no mention from the newly self-appointed defenders of the elderly. I guess that the for-profit health provider industry and the drug makers can thank these faux defenders of Social Security for giving them an excuse to continue raising their profit margins on the backs of social security recipients. So let's summarize. There is no cuts - none - in the basic benefit formula for social security. There is a floor of benefits - above the federal poverty level. And the way to address medical expenses is to actually address medical expenses, and we need to stop using social security to stuff the coffers of the hospital and drug industries. Let's stop the bizarre freakout over minor adjustments to COLA that, along with other measures proposed by the Fiscal Commission (like bring the Social Security tax base back up to 90% of all income rather than today's 82%), is designed to preserve social security and its basic benefits for the long term, and for the first time fulfill the promise of social security: to lift anyone who has had a long enough work history out of poverty. Let's cool off a little, and realize that this President is actually the one that's really trying to strengthen social security, and not just use it as a slogan and a whack-a-mole.